Do you need to wear mask in your own home? Below is the movie trailer and a tiny synopsis about the movie, aren’t this make you feel blessed? The protagonist illness called SCID (severe combined immunodeficiency) she needs to be in a germ free and clean environment even the air needs to be sanitize. because the tiny bits of allergens can be so dangerous for her health. How come my indoor air is polluted? Simple, because we close our windows and doors all the time, resulting to inadequate ventilation. We increase indoor pollutant levels by not bringing in enough fresh outdoor air to dilute emissions from indoor sources and by not carrying indoor air pollutants out of the home. High temperature and humidity levels can also increase concentrations of some pollutants. New Carpet! You heard that right. Even though you install a new carpet it is still best to have The Healthy Carpet clean it. Carpet materials can emit a variety of volatile organic compounds (VOCs). Tip: After new carpet installation, keep you windows open and run a fan for two to three days. Broken compact fluorescent lights. Do you have this lying around? You keep saying to yourself that you will throw it and it is still there after a week? Well CFLs emits mercury, a neurotoxin so get on with it and throw that broken bulb! New electronics and other plastics. Most of these products are made with polyvinyl chloride which can emit phthalates. This chemical has been linked to hormonal abnormalities and reproductive problems. Plastics can also release flame-retardant chemicals, such as polybrominated diphenyl ethers, which have been linked to neurobehavioral changes in animal studies. Glues and adhesives. 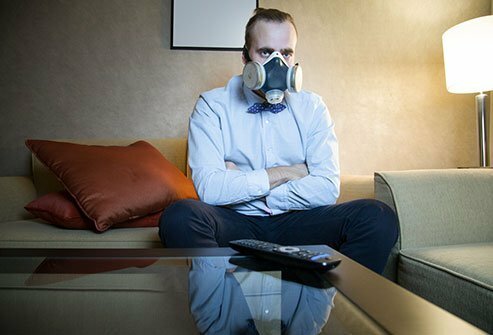 emit VOCs, such as acetone or methyl ethyl ketone, that can irritate the eyes and affect the nervous system. Rubber cement can contain n-hexane, a neurotoxin. Adhesives can also emit toxic formaldehyde. Heating equipment (stoves, heaters, fireplaces, chimneys). Heating equipment, especially gas stoves, can produce carbon monoxide, which can cause headaches, dizziness, fatigue, and even death if not ventilated properly. They emit nitrogen dioxide and particulates, which can cause respiratory problems and eye, nose, and throat inflammation. Paints and strippers. Latex paints are a big improvement over oil-based paints because they emit fewer chemical fumes. But still all paints can emit VOCs, which can cause headaches, nausea, or dizziness. Paint strippers, adhesive removers, and aerosol spray paints can also contain methylene chloride, which is known to cause cancer in animals. Tip: Look for low VOC paints. Upholstered furniture and pressed-wood products (hardwood plywood, wall paneling, particleboard, fiberboard). When new, many furniture and wood products can emit formaldehyde, a probable carcinogen that can also cause eye, nose, and throat irritation; wheezing and coughing; fatigue; skin rash; and severe allergic reactions. If you have any of the products above, which I am sure you do as they are our common household items. Then, you need The Healthy Carpet. We are IAQ approved. The only carpet cleaner in the triangle with this stamp. Which means after we clean your carpet, we also improve your indoor air quality. Call us at (919) 446-5379 or you can schedule your cleaning online anytime.